Take a look at what our clients have to say about us! Not only are we a family, our clients are our family as well! We are honored to serve each and every client and we look forward to having you join our family here at Simplicity! "Great cut, great conversation!!" ~ David E.
"It is always so relaxing I just wanted to sit there for two hours! Awesome staff bc you are all such genuine people" ~ Beverly M.
"I always love your service and attentiveness to customers"
"Love coming there. Makes me relax and the people are the best. Great job ladies" ~ Susan S.
"Everything was perfect. My daughters hair turned out beautiful. Thank you Jen for a wonderful job" ~Alicia H.
"Everyone is so friendly and I love Fran, she put the Wow back into my hair, great colors" ~Melissa R.
"Simplicity Salon is the best!!" ~Selina M.
"Favorite Salon in the Lehigh Valley! The entire staff is very friendly and accommodating. You can't go wrong with any of the Stylists. They are all creative, professional, and very good at what they do. I don't often write reviews, but I am a big fan of Simplicity Salon and recommend checking them out!" ~A.J. ​"My experience at the salon was great. All of the workers were friendly and welcoming. They were all professional and my haircut and style came out perfectly. I love my new look. Normally I am picky and scared but i now have complete confidence in all of the work done here. It felt more like a girls day out then just a routine cut." ~Linda C.
"I've been visiting Meaghen at Simplicity for a while now for my own hair needs, and when it came time to book hair appointments for my wedding, I knew I would go with Simplicity! The day of the wedding came and the entire staff was AMAZING!!! Meaghen did a perfect job on my hair and make-up, and I was blown away by the styles the rest of the ladies did for my bridesmaids and family! They were even able to make a gorgeous up-do for my sister, whose hair hits just above her shoulders. The best part was, we were finished a full hour early, giving us time to relax (which is very important on your wedding day!). I would highly recommend the team at Simplicity Hair Salon to anyone for routine hair care, or for a formal event. They are truly fantastic!!!" ~Elizabeth M.
"Tracie is a mind reader and always knows what to do with my tons of hair!" ~Aletha F.
"Meaghen was confident that she could give me the cut and color I would be happy with. Everyone was like family." ~Gail B. "Fran is the BEST! I always love my hair when she colors and cuts it! And she is the nicest person to all of her customers! Love this shop" ~Margaret M.
"Tracie did an excellent job as always" ~ Jonathan M.
"Great job on both the cut and the highlights! As a new customer, there is always some level of trepidation when changing salons/stylist. Fran quickly put me at east, discussed the process before we started and asked probing questions to ensure she understood my expectations. I couldn't be more happy with the results and I;ll be back for sure and spread the word about Fran and the Simplicity Salon! Thanks! ~ Kristine B. "Everyone is so friendly and nice. It's a wonderful place and the hair care products and hair cuts are perfect." ~Denise D.
​"Amazingly professional and welcoming staff. I would recommend to anyone. Awesome work done!!!!" ~Kaitlin B.
ir. She is a miracle worker! Amazing place! Cannot wait to go back!" 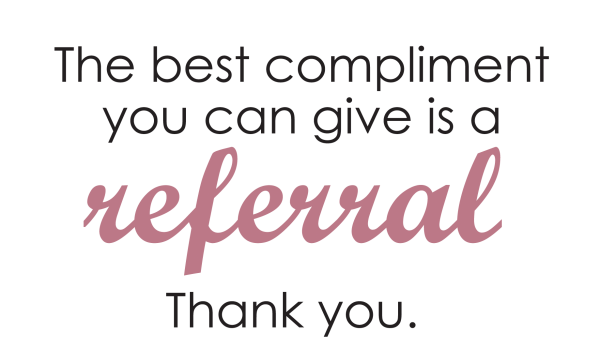 ~Jaclyn D.
We appreciate our clients, and want to reward you for sending in your friends and family to us! For each client you refer to us, you will receive 25% of their service charge as a credit on your next visit with us! Thank you for entrusting us to help you look and feel your best!